were very personal to me, a way to explore who I am, what I’ve experienced in my life, and my studies involving other cultures. 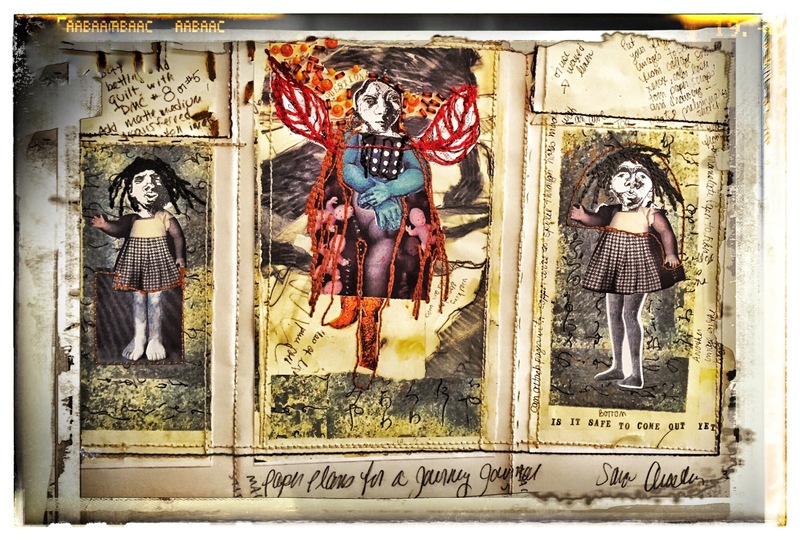 They were a way to put everything together — drawing, painting, printmaking, sculpture. 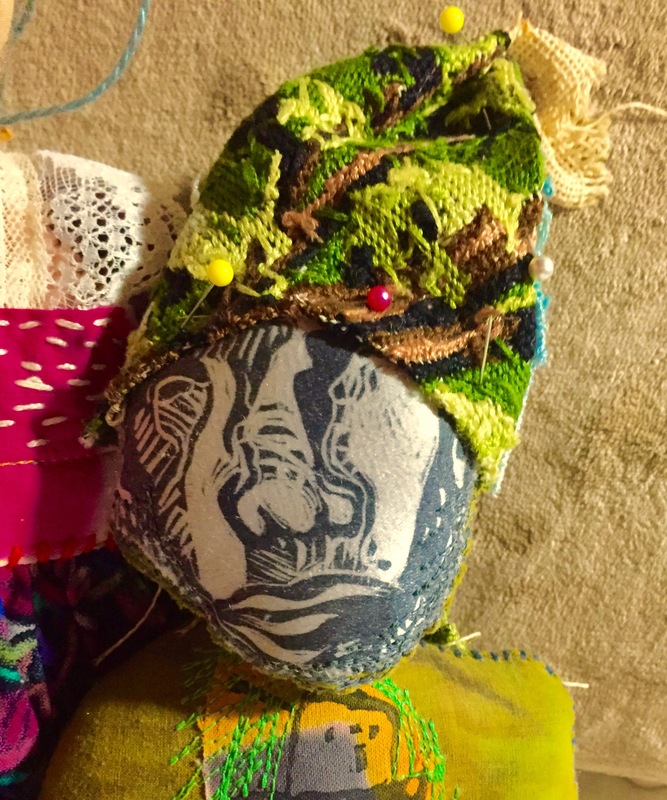 Now I was incorporating my love of fiber, color, embroidery, beading and exploring the idea of what is a doll. How far could I go outside the boundaries of doll making, and still have the piece be a doll. I am still pushing those boundaries. There is still much to explore here. When I group them together, I start to see new families. If you have lost a loved one, you can create an effigy figure to keep you company. I have made many of those to help me go from grieving to healing. If you don’t fit in with your original family, you can create another one. There are many ways to go here, and the only limit is the imagination. With a doll, you are never alone. 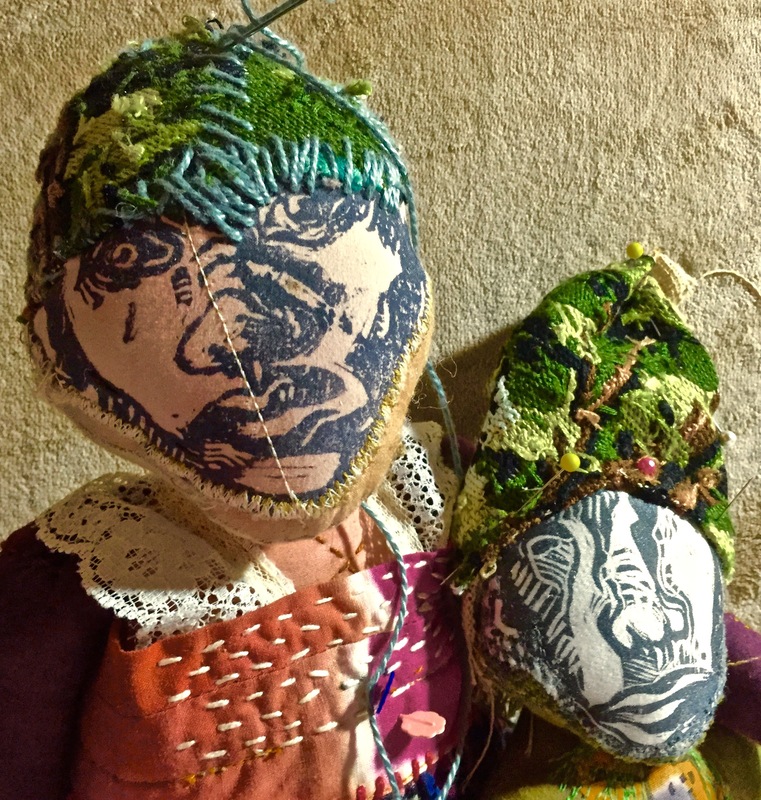 Have you ever made a doll? you look like you’re from my tribe. wanna hang out? I’m in my studio, where I can do whatever I want, in total silence, or with my music of the day. 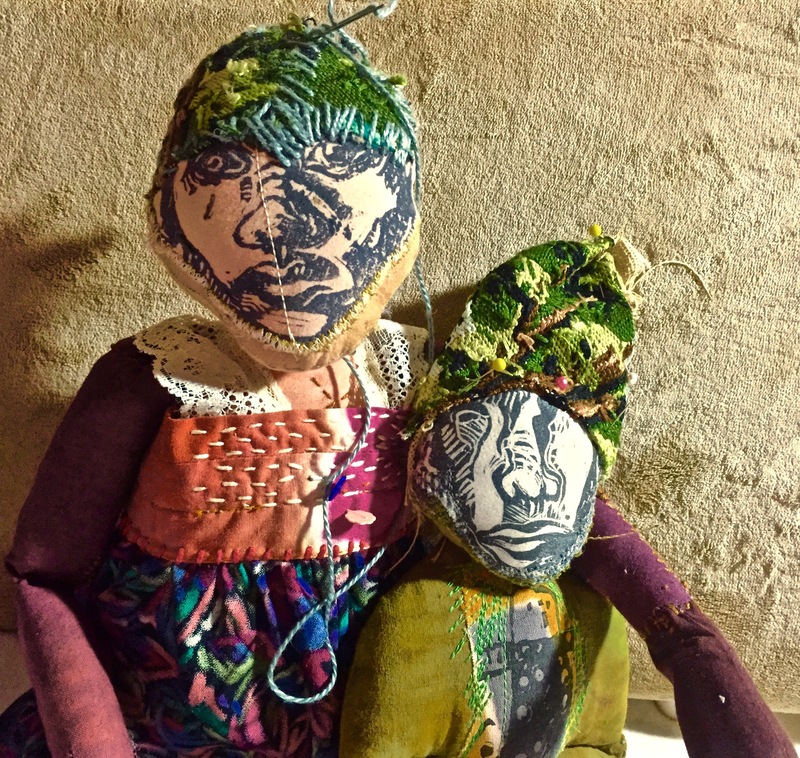 These days my thoughts jump from drawing to painting, to printmaking, to fabric dye painting, to designing fabric, printing more cloud photos, make more photo collages, and then. . . . there are the dolls. They don’t give up and they are the loudest in their insistence on being born. They call me. They stare at me. They comfort me. They always want more from me. And like the Mom I once was, I can’t say no. These 2 little guys have been waiting patiently for me to return for a whole year. I put them in a comfortable chair together and told them I would be back soon, while I went off to create many self portraits. This turned out to be the year of the self portrait. There were so many photos, altered photos, stitched photos, torn photos, and then there were drawings. I believe it will never stop. So much growth has occurred inside of myself by working in this way. It has been good. But, as I once put the dolls aside to work on my self portraits, now it is time to put all those self portraits aside and return to the dolls, my children. I want to do something more than make them. Something I used to do years ago. I taught all kinds of fiber classes and my favorite and everyone else’s, was always creating the doll. There are many that are complete and each one has a story. Quite a few are living in other homes with other mothers and I can only hope they are being treated as the special children that they are. It is always hard to let go. The best dolls always end up as self portraits, revealing something more about myself, as a child, an adult, a mother, a teacher, a friend. There are dolls about my mother, my father, my daughter, and a best friend. These dolls keep me close to those people that are no longer part of my life, but who have helped form the person I am now. Dolls are surrogate friends and children. With a doll, you are never alone . 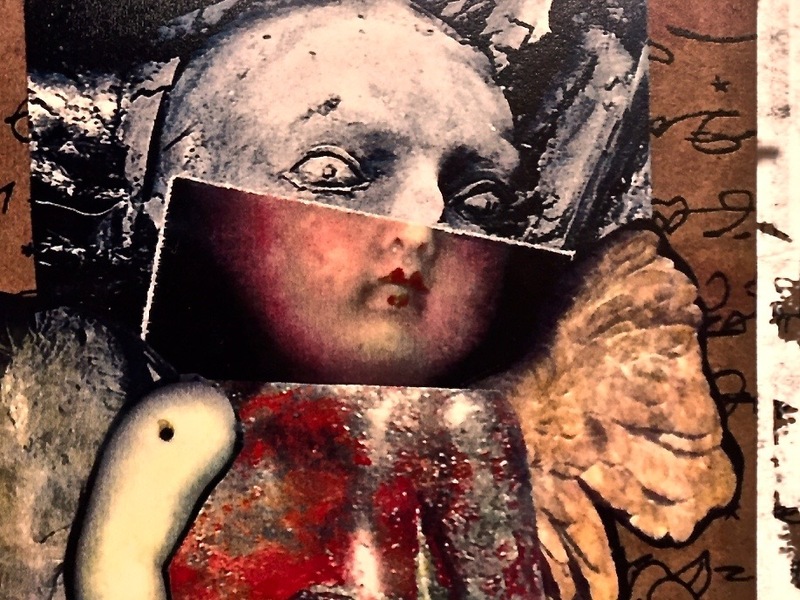 . . not if you made that doll, thought it up all by yourself, and it grew out of your heart. This doll is one of a group of 3 “Homely Girls” with attitude issues. The rebel artist was formed inside of her and she will always be closer to me than all the others. But I’ll never tell. What’s important to know is that your doll can reflect some part of you that is essential to your being. She can serve as your reminder to be true to yourself. It has been a few years since I made a doll, and I wonder who or what will need to be created. Some things I know. There are dolls waiting in my head to be born and I don’t know what they will look like. I start with pieces of fabric, drawings of faces, some of my favorite dolls to hang out with me while I get started, and, of course, sketchbooks and notes. I will begin by creating connections in time with various images and materials on a bulletin board. I have all this stuff here from working over 30 years and it all feels so special, these scraps, broken figures, odd things that would seem to be trash to anyone else but me. There are many drawings of dolls from other cultures that inspire me. These pieces carry memories, ideas, plans, and even parts of special people. Waiting to jump right OUT. it runs right on by you. Is one image better than the other? or, just the other side of the story. Some of these babies wait a long time. They’re hanging out on the floor, keeping each other company. Here they are today. There will be some changes soon. Thinking of taking them apart, just pieces, and trying something new. Will let you know what happens.